When it comes to high profile family feuds of the super-rich in Hong Kong, the sagas of the Kwok brothers of Sun Hung Kai Properties and Nina Wang of Chinachem Group had captivated the HK public in the past two decades. A low-key Shanghainese family headed by Chun-Kiang Koo (顧春江, hereafter referred to as C.K. Koo) had the rare distinction of being connected to both of these families as C.K.’s second son Koo Ling-ching was the business partner of Nina Wang’s father in law in the distribution of ICI chemical products while Ling-ching’s daughter Lydia Koo was the first wife of the recently deceased former SHKP chairman Walter Kwok. Despite having played a crucial role in the development of the chemical industry in Shanghai, HK, Southeast Asia and beyond, the story of the Koo family remains little known and the press continues to mislabel Koo Ling-ching as the proprietor of Koo Sun Kee, a leading contractor and distributor of wallpaper which actually was owned by the family of the unrelated Koo Sun-sai (to be covered). Below is an attempt to piece together the family saga which started in Shanghai, extended to HK and then to Malaysia, Singapore and Nigeria. Little is known about C.K. Koo himself who was born in the late Ching dynasty (presumably 1887 based on his 90th birthday celebration in 1977). His four sons built him an enormous grave in Taiwan which is highly regarded by local fengshui masters. C.K. Koo had four sons – Koo Ling-king (顧林肯, 1910-1991), Koo Ling-ching (顧林慶, 1912-? ), Koo Lin-hwa (顧林華, 1913-2016) and Koo Lin-shen (顧林深, 1921-) in order of birth and by the late 1940s, they were operatingYoung Hwa & Co (榮華股份有限公司) in Shanghai which was distributor of industrial chemicals such as dyestuff manufactured by British chemical giant Imperial Chemical Industries (ICI) in partnership with Wang Din-shin (王廷歆, 1911-2010), the father of Chinachemchairman Teddy Wang. 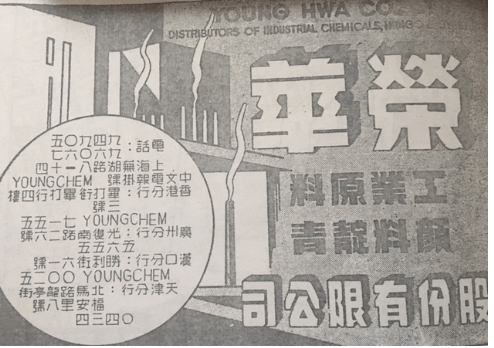 According to the 1948 ad shown above, in addition to its head office in Shanghai, Young Hwa had a branch in Hong Kong on the 3rd floor of the Pedder Building in Central (where it continued to operate out of into the 1970s) and had branches in Hankow and Tientsin. In addition to holding shares in Young Hwa, their business partner D.S. Wang also started China United Chemical (Chinachem) which operated out of Sassoon House in Shanghai where the Cathay Hotel (華懋飯店) was located and how Chinachem derived its Chinese name. In 1949, the Koo family relocated from Shanghai to Hong Kong where they eventually bought out D.S. Wang and became the sole beneficial owner of Young Hwa & Co (HK) Ltd (incorporated in 1946), which remained the master distributor of ICI products for three decades. A 1954 article shows Young Hwa hosting the head of the overseas business division of ICI at the Tai Tung Restaurant in a Chinese banquet which was attended by the Who’s Who of the textile industry at the time including Shum Choy-wah, W.H. Chou, Yan Man-leungand Chong Hu-kwong (see individual articles on their careers). At that time, the managing director of Young Hwa was Koo Ling-ching and he was also executive director of the Kiangsu Chekiang Residents Association and was asked to take over the football (or soccer) department of theKwongWah Athletic Association (光華體育會) in August of that same year as his predecessor C.S. Wong (王志聖) became the chairman of HK Football Federation. (Wong served in that position until 1960 when he was arrested and later expelled by the colonial administration for his pro-Taipei stand) However, within less than a month, Ling-ching turned down the job as he was busy with the construction of The United Enamel Works in Tsuen Wan and was substituted by Y.L. Nie of Shanghai Yaik Sang Construction (see article on Shanghainese Builder – Part 1). United Enamel Works was incorporated in 1954 with $600,000 in capital to make metal windows and enamelware. As a company, it was dissolved in 1985. Aside from enamelware, Ling-ching also worked with his fourth brother Lin-shen in building chemical plants in Malaysia and Singapore (to be covered in the next section) in the late 1950s and as he shifted his focus to manufacturing, the management of the distribution business of Young Hwa was transferred to third brother Koo Lin-hwa. In addition to Young Hwa, Koo Lin-hwa was also a director of Pearl Garment Factory, a manufacturer of fancy knitted shirts led by Yien Pao-wah (嚴葆華), who was a Tung Wah director in 1977. 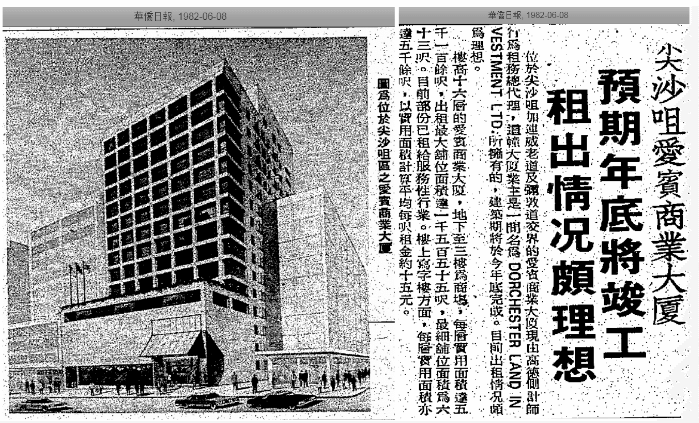 In 1978, the family through Young Ya Estates (incorporated in 1976 and dissolved in 1987) developed the 25-story Young Ya Industrial Building (榮亞工業大廈) at a 40,000 sq ft site at the intersection of Texaco Road and Tsuen Wan Road in Tsuen Wan. Aside from soccer, Koo Ling-ching was also into horseracing in HK and had owned several houses over the years (in chronological order) – “Prosperity” (榮華富貴, 69-70, first two characters of Chinese name is the same as Young Hwa),” Flying Phoenix”(飛鳳,77-78),”Indigo”(應得高,81-82, named after the type of dye), “Procion”(保施安,86-87, named after a brand of dye manufactured by ICI) and“Flying Phoenix II”(飛鳳二世,90-91). In the late 1950s, the Koo family began to expand outside of Hong Kong with Malaysia and Singapore as the focus and fourth brother Koo Lin-shen leading the charge. Born in 1921, Lin-shen graduated from St John’s University in Shanghai in 1944. In 1952, he visited Kuala Lumpur for the first timeen route to Europe and was impressed with the stability of Malaya relative to the Greater China region at the time. In 1957, he moved to Malaya and formed Malaya Acid Works, the first manufacturer of acid in Malaysia the next year (1958) with second brother Ling-ching as chairman and himself as managing director. The 17.26 acre plant in Petaling Jaya in Selangor went into production in 1959. In 1960, the firm expanded into the production of formic acid, a chemical critical for the coagulation of rubber, Malaysia’s number 1 export. The new formic acid plant was allegedly the second largest in the world next to Germany and included facilities and equipment made in the UK, France and Italy. In 1962, another wholly-owned subsidiary Malaya Acid Works (Alum) SdnBhd started producing aluminum sulphate and hydrated lime for water treatment plants in Malaysia. In 1961, the Koo family formed Chemical Corporation of Singapore (CCS), a 50-50 joint venture with local interests in Singapore to manufacture sulphuric acids with Borneo and Indonesia as target markets. The original plan was to build a factory in Bukit Timah with production capacity of 20 tons a day (7000 tons a year) by 1962 but the project somehow moved to Jurong (CCS was one of the 14 industrial pioneers that turned Jurong Town from wasteland into the major industrial zone in Singapore) and the product types and annual production capacity also expanded to 20000 tons of sulphuric acids, 15000 tons of alum and 5000 tons of formic acids and was finally opened in 1964. L.S. Koo, who controlled 40% of Malaya Acid (while Ling-ching held 50%, Ling-king and Lin-Hwa each held 5%) managed the firm for decades and the firm’s sales was 36 million ringgit in 1992. Aside from Malaya Acid, the family also controlled Federal Fertilizer and Malaysia United Chemicals in Malaysia. By the 2010s, the plants of Malaya Acid Works in Selangor were closed and the family put the land up for sale in 2016 with estimated value of RM300 million. In 1968, the brothers set up Chemical Company of Nigeria in partnership with Cha Chi-ming of China Dyeing Works (and later best known for the Discovery Bay development). This was run by the eldest brother Richard Koo Ling-king. Ling-king eventually left Africa and retired to Vancouver, Canada where he died in 1991 and was survived by his wife Yung-Tsung Chang (1908-1992) and 4 daughters – Mei Lien, Mei Yu, Mei Yee, Meina and 3 sons – Hao Sui, Dr. Daniel Koo and Dr. Jarley Koo. Koo Ling-chingand his wife Yeh Hui-hsia (葉蕙霞, died in December 2001)were survived by 4 children – Charles Koo Ho-tung(顧浩棟), Angela Koo Chi-fong (顧芝芳), Henry Koo Ho-liang(顧浩樑) and Lydia Koo Chee-yung (顧芝蓉). Henry Koo is the proprietor of Albion International Holdings (愛賓國際), which is a manufacturer of food and beverages. Albion’s subsidiary A-Marthad operations in Singapore, Guangzhou, Shanghai, Beijing, San Francisco and Dallas and opened its first food store in HK in Fanling in 1997. In 1982, the firm developed Albion Plaza (愛賓商業大廈) at 2-6 Granville Road in Tsim Sha Tsui. In 2008, Albion Plaza was sold to Henry’s sister Lydia for HK$957 million. Henry is married to Vivien Chan (陳韻雲), the proprietor of the law firm of Vivien Chan & Co and daughter of developer Chan Chak-yu (陳澤儒) and niece of Chan Chak-fu, the founder of Park Lane Hotels International. Viven and her daughter Anna-Mae Koo (顧曉楠) through their V group of companies developed serviced apartments in HK. Lydia Koo, who had a brief marriage to Walter Kwok in the 1980s, was a senior executive of HSBC and served on the board of Hsin Chong Holdings (see article), Lee Gardens Hotel and Cathay Pacific in the 1980s. Koo Lin-hwa died at the age of 103 in May 2016 and his children also achieved success outside of the family business – Benjamin Koo (顧浩鍾), who received his BS and MS in chemical engineering from the University of Wisconsin and MIT respectively, served as a senior executive of Yum Brands in China and a director of Little Sheep Group while Helena Koo (顧浩明) is a senior private banker who had served as head of premier clients for HSBC and led Chase Manhattan’s private banking operationg in North Asia before joining Goldman Sachs as head of private banking for Greater China in 2004. Koo Lin-shen’s children are Catherine Koo, Edward Hao-Mang Koo and Alexander Hao-Nan Koo. This article was first posted on 11th February 2019.